DNC Electronics GmbH supply's CNC parts and in-house Fanuc CNC repair services throughout continental Europe. Offering CNC parts, exchange, outright surplus, and test and repair services primarily on Fanuc CNC electronic parts for your machine tool. Similar to the services offered over the last 20 years to the rest of the world by DNC. 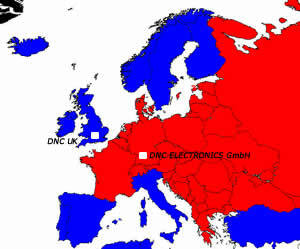 DNC Electronics GmbH will concentrate on Germany, France, Netherlands, Switzerland, Poland, Belgium, Austria, Denmark, Greece, Czech Republic, Slovakia, Greece, Russia and other countries of Eastern Europe. The same unparalleled levels of supply and service of CNC parts, with terms, conditions and prices that reflect the German and European market needs. Warranty is 180 days on exchange and repairs. New CNC Parts such as CRT replacement monitors and New Surplus Fanuc Parts come with a 12 month warranty. New LCD based CNC Monitors and DNC built psu's come with a 2 year warranty. Massive 30% - 80% savings on OEM prices. DNC Electronics GmbH are independent companies and have no affiliation to Fanuc Ltd (Japan) branches, Siemens GmbH, Mitsubishi Ltd (Japan) and / or there respective agents. DNC use all the main carriers to ship to all the countries in EU/EC/ECC region, including UPS, TNT, DHL, Fed-ex, and will happily ship on customers accounts.